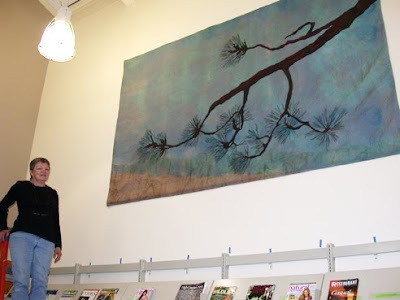 I was asked to make a large silk piece for the Lake Tahoe Community College's new library. It is a beautiful space with a great deal of light and wonderful spaces to relax, read and contemplate. I was asked to create something reflecting our beautiful scenery. 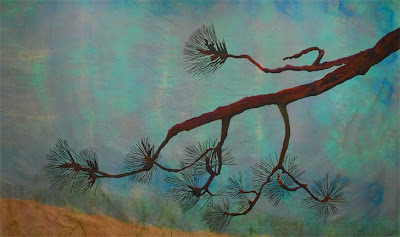 I chose to as my subject a pine bough image inspired by the Jeffery Pine trees nearby my home at Nevada Beach. 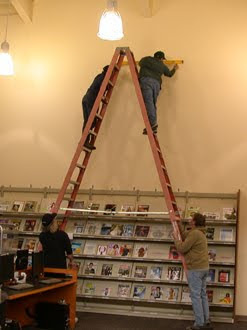 I was fortunate to have wonderful help from the library director, Lisa Foley, the art department's chair, Phyllis Schaffer, the head of the 3-D lab, Francis Rider and a great maintenance crew. This piece is hand-dyed and hand-painted silk, quilted with monofilament thread and backed with scenery canvas. It was a great experience, creating such a large piece. It measures 10' x 6'. Luckily I had a design wall that was 10' long. It was a huge challenge to dye and quilt such a large piece.